Seventeenth century print of the Irish College in Louvain. A variety of source material survives from which the history of Gaelic society in the early modern period can be reconstructed. Rather than focusing too narrowly on bardic poetry as a means of interpreting the native Irish response to colonisation, the full range of extant sources should be utilised, in conjunction with the available English language ones, to produce a more comprehensive interpretation of the history of early modern Irish communities. 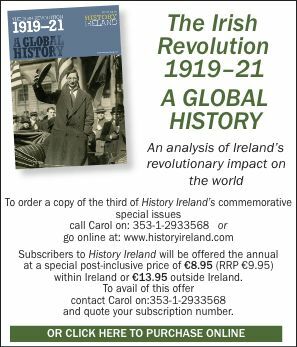 There has been a transformation, in the last thirty years, in the way the history of Ireland in the sixteenth and early seventeenth centuries has been written. The wide availability of microfilm copies of State Papers (PRO SP63) has made possible in-depth analysis of the Tudor administration’s activities in Ireland. The broad scope of the State Papers and their relative accessibility and ease of use has meant that they have been the staple diet for research students and historians working on any aspect of the so-called ‘Elizabethan conquest’ and the history of Ireland in the early Stuart period. The existence of hundreds of documents for each year, neatly arranged in the archives in chronological order, for the most part extensively calendared and indexed, is reason enough to ensure that the State Papers are likely to continue to hold a pivotal place as a central source for the history of early modern Ireland, and rightly so. These, along with the other surviving documentation of the Elizabethan and early Stuart administration in the form of legal records, fiats, patent rolls, surveys and inquisitions, are of immense value, not just for the history of the English administration in Ireland, but for the history of the Gaelic and Gaelicised communities also. It cannot be denied, however, that the official correspondence which makes up the bulk of the State Papers reflects the biases and preoccupations of the English administration, and hence gives only a very partial view of Gaelic society. Over the last twenty years there has been a growing awareness of the need for historians to balance the English administrative version of events with an assessment of the native response to conquest and colonisation. Quite literally only one or two people have taken the process a stage further and seriously attempted to look at native Irish society on its own terms and not merely in the context of its being assumed to be a ‘colonised’ community. Significantly these are medievalists, who have extended their researches into the sixteenth century, rather than early modernists who have looked back from the apparent fait accompli of an ‘Elizabethan conquest’ to consider what it was that had been conquered. Reduced facsimile of O’Hara MS., folio 20. Early modern historians who have tried to balance the viewpoint of the ‘coloniser’ with that of the ‘colonised’ have looked for any available source material emanating from Gaelic Ireland in order to produce a more rounded picture. What have they found? First, the various annals, prose compilations of history, recording major events and significant people from the Gaelic past, arranged in chronological order, and now published with English translations of varying quality. At first glance, the diversity of material they contain, more a miscellany than a coherent whole, gives the impression of a limitless quarry of detail, from which the historian can select at random. Superficially, the formal structure of the Irish annals creates an impression that they are an impartial source. While users of other sources make allowance for the perspective of the author, there has been little detailed study of the authorship of and sources used in the surviving annals which contain entries relating to the sixteenth century. It is well known that the Annals of the Four Masters have an O’Donnell bias, and the Annals of Ulster an O’Neill bias, but such considerations are not always noted by those using them as a source. While, in the absence of alternatives, we use the annals as a primary source, we need to be aware of their predominantly local rather than national perspective, and to realise that they are edited highlights, selected and re-selected by the compilers from the range of material at their disposal. We must remember that they are in reality secondary sources, the work of earlier generations of historians, and not the product of an administrative system within Gaelic society. The second major source is bardic poetry. Thanks to the work of an earlier generation of scholars, particularly Osborn Bergin, Eleanor Knott, Lambert McKenna, Paul Walsh, and more recently Cuthbert McGrath, James Carney and Brian Ó Cuiv, a large quantity of bardic poetry is now available in print, some of it with English translations. Its availability in print has been the principle determining factor in its new-found popularity as an historical source. Neither its inherent exclusivity, its selectivity, nor the problems of interpretation have deterred historians from trying to use this tool to prise open a window on Gaelic society in the early modern period. The results to date indicate that it is sometimes a specialist tool in the hands of apprentices. Historians have turned to the poetry not because it is an easy source to interpret, but because it is the most obviously political material emanating from Gaelic Ireland. Historians redressing the balance of ‘Elizabethan conquest’ by looking at the response of the native community are asking essentially political questions about the reaction of Gaelic society to conquest. Poems in praise of Gaelic chieftains or aspiring chieftains, or laments on the deaths of chieftains are perceived to be the best expressions of Gaelic sentiment, and have been examined in particular for the evidence they contain on the native response to conquest and colonisation, and the development of a sense of national identity. Perhaps the most thorough attempt to date has been the work of Marc Caball (See HI summer 1994). But he does not fully confront the issue of whether it is logical to look to the literature of a localised lordship society for clear-cut political statements on the national question. Is such an approach valid, or does it risk being anachronistic, dangerously misleading, or simply a harmless waste of time? The poetry can be used to understand something of the ‘mentalité’ of the Gaelic intelligentsia (see recent work by Breandan Ó Buachalla) but can the poetry be hammered into shape so that its answers questions framed in language, or expressing concepts, its authors would not have understood? It is perhaps time for historians to consider other categories of material which survive in Gaelic manuscripts. Some very interesting work has recently been published by Caoimhín Breatnach in Eriu, on late sixteenth-century recensions of prose tales. We need to consider such tales to try to understand their purpose in Gaelic society. Less obviously political than the poetry, do the tales a community tells, or chooses to remember, nonetheless reflect the preoccupations of that society? In early modern Ireland there were other professionals apart from the poets and historians who have left records. Medical manuscripts reflect the needs of people then as now to seek cures for their ills. They also reveal that the medicine in Gaelic Ireland was practised in accordance with European standards of the day. In this context we should recall the steady trickle of Irish medical students to European universities during the early modern period. We should remember the trade links with Europe which allowed the importation of medicines, as well as medical knowledge. What questions can we ask of the surviving sources in that broader context? Do the marginalia on medical manuscripts provide a clue as to what was specifically Irish? The aura of antiquity surrounding legal manuscripts transcribed in the sixteenth century, hinting at an unchanging conservative ethos, has been shown in the recent work of Nerys Patterson (Irish Historical Studies 1991) to be little more than an ‘aura’. Using much the same techniques as Caoimhín Breatnach has used for folk tales, she has demonstrated that the innovations in the pseudo-historical prologue to the Seanchas Mar, transcribed in the 1570s from a twelfth-century source, contains evidence of Gaelic legal experts of the late sixteenth century subtly modernising their legal texts to take full account of current political and social realities. While Marc Caball may have succeeded in marshalling an impressive array of evidence showing Gaelic opposition to English influence in Elizabethan Ireland using the bardic poetry, the evidence of the legal texts, reflecting a world more pragmatic than political, reveals, perhaps, a greater degree of accommodation. Historians of early modern Ireland, who look to Gaelic source material to answer questions they have posed themselves, rarely venture into the archives to look at manuscripts. Perhaps the sheer range of material is too daunting. Of the bardic poetry which has survived, about fifty per cent was composed after 1550. This reflects the pattern of survival of manuscripts, not the rate of composition. Confronted with over 1,000 poems, many very lengthy, early modernists usually content themselves with what is easily available in print. Apart altogether from the selectivity of what has been published, this approach has serious drawbacks. Not the least is the detachment from the original text, with all its imperfections, its scribal context, the reasons the text is extant. At one remove from contact with the actual primary source, and using only the clinically correct printed translation, the historian is tempted to attribute a definitiveness to an edited poem beyond that which would seem justifiable to that same historian confronted with the less than perfect, late transcription of that text which actually exists in the repository. Pages from the dedication of The Annals of the Four Masters, addressed by Micheal O Cleirigh to patron Fergal O Gadhra. Even allowing for the necessity for most historians, in practice, to concentrate on the published selection of Gaelic texts, we are not yet at the end of the process of selection. Possibly because of the lack of adequate bibliographical guides to available material, there has been a tendency among historians to concentrate on the material contained in a few edited poem books—the poem book of the O’Reillys, the book of O’Hara, the Leabhar Branach—partly for convenience, and partly because in these instances at least there is some chance of providing an adequate context within which the message of the poem can be evaluated. Such duanairí, or poem books, have come down to us because a range of poems relating to one particular person or family were assembled by the scribes into a poem book. They contain poems of praise, and occasional laments on the death of a chief. Some can be narrower in scope than we might hope. For example, the poems on the O’Reillys which relate to the latter half of the sixteenth century do not relate to the most politically prominent of the family. They almost all relate to the exploits of one man, Philip O’Reilly, who eventually became chief of the O’Reillys in 1596 only to be killed by some of the O’Neills six weeks later. We cannot write the history of the O’Reillys in the sixteenth century on the basis of a collection of flattering poems about Philip O’Reilly alone. We cannot generalise about Gaelic Ireland from specific poems written in support of one faction. We must remember the propaganda role such poems played at the time of their first composition. Should we not also ask how many other poems written for others of the O’Reillys failed to be recorded in the same way and have now been lost? Most of what survives of bardic poetry of the period 1200 to 1600 is known to us today only through transcripts of the seventeenth or eighteenth or even nineteenth centuries. We are working with chance survivals. Have we considered that they may frequently be the survivals of the winners rather than the losers? Or do we make the mistake of subconsciously assuming that in Gaelic society there were no winners? When confronted with an individual poem, its message has to be extracted from the complex web of allusions it contains, a hazardous task, in which we must always be conscious of the author and the intended audience. We must also, in so far as is possible, use other sources, whether State Papers or legal material, or the evidence of the annals, as tools with which be build an interpretative framework to decode attitudes at the time of the poem’s composition. It seems to be stating the obvious, but we must not take poems out of context, or worse still, odd stanzas out of context to prove a general thesis. The need for caution applies to other problematic material also. Genealogies no less than the poetry are political statements concerned about legitimising political realities by modifying the record of the past. Books of rights such as the Ceart Uí Néill are likewise composite layered texts, containing material from different eras, and need to be carefully deconstructed to reveal evidence of current realities at any particular point in time. There are undoubted interpretative difficulties in dealing with them, many of which are not easily resolved, and can best be overcome by viewing such texts in the light of other available sources. How can we improve the way we write about early modern Ireland, using the extant source material of Gaelic Ireland? At the risk of being called ‘normalisers’ we need to rethink the sort of questions we ask about Gaelic society. We need to look beyond the political question of the coloniser/colonised relationship, to focus more on the diversity of Gaelic society itself, and not just look for a single ‘Gaelic response’ to conquest and colonisation. To what extent is the native versus newcomer dichotomy valid? Consider the ease with which the Gaill of the thirteenth century cease to be foreigners, so that the Gaill of the late sixteenth-century poetry and annals are an entirely different political and ethnic group, the older wave of settlers having been by and large absorbed, an absorption reinforced by contemporaries when they revived and revised the Leabhar Gabhála, the Book of Invasions, in the early years of the seventeenth century. Is absorption of outsiders not an inherent characteristic of Gaelic society, rather than a threat to its very existence? Or is that a misleading oversimplification? Halfpenny stamp(1944) on the tercentenary of the death of Micheal O Cleirigh. At the very least, interaction with external influences is a two way process and that between native and newcomer in early modern Ireland is no exception. While not all of Albert Memmi’s theories on colonisation are borne out in practice, we would do well to remember one of them in an early modern Irish context: ‘Possession of two languages is not merely a matter of having two tools, but actually means participation in two psychical and cultural realms’. (A. Memmi, The Colonizer and the Colonized, London 1974, English transl.) Increasingly, the inhabitants of Ireland were becoming bilingual during the seventeenth century, the native community learning to speak English while many newcomers learned some Irish. Whatever about their language skills, both groups were living in an environment which encompassed aspects of more than one set of values, laws, cultural life, and so on. Should we not accept that there was a diversity of intellectual and political responses to English influences in early modern Ireland, ranging from acceptance to collusion to acquiescence to opposition, and not excluding indecision, prevarication, and confusion? Can we then move beyond that issue and begin to ask how Gaelic society actually worked, and what issues were of particular significance for that society? Can we look again at the full range of Gaelic sources available—annals, poetry, prose texts, genealogies, legal and medical texts—use them in conjunction with the relevant administrative and legal records which survive in English sources and ask new questions which address Gaelic society on its own terms? We could start, for instance, with the framework of political succession, move on to the mechanisms for change inherent in the social structure, the implications of kinship, succession, intermarriage, the role of women in political, cultural and social spheres, the concept of honour, the reasons for war, the sources of wealth and their implications, the scope for expression of personal ambition, the economic and political limitations of the lordship structure, and much, much more. The history of Gaelic Ireland in the early modern period has not yet been written, but perhaps we know what we need to do. We need to think in terms of Gaelic lordships as comprising overlapping communities of interest, familial, social, military, economic, religious, cultural, as well as political. We need to be aware of regional diversity, of the lack of uniformity of Gaelic society, and then to explain it in all its diversity. We need to be aware that native Irish society had its own internal dynamic. We need to consider that the external influences on that society were European as well as English, Scottish and Welsh. Particularly for the seventeenth century, we should consider the possibility that some Gaelic ideological, political, and religious perspectives were no more exclusively ‘home grown’ than its medicinal cures. It is a truism that before we can attempt a comprehensive history of Gaelic society many in-depth local studies of individual lordships must first be undertaken. Rather than broad general topics using a narrow range of sources, such as has been the recent trend among research students using sixteenth-century Gaelic sources, what we need are studies of individual lordships over time, combining the evidence of the annals, poetry, prose texts, and genealogies in Irish with the extant English language sources. It may well be that a single history of Gaelic Ireland is an elusive goal, but we should at least try to reconstruct aspects of early modern Gaelic lordships, and the interconnections between them, using the widest possible range of sources, in any language. Bernadette Cunningham is a librarian in the Dublin Diocesan Library and occasionally lectures in history at St Patrick’s College, Maynooth. K. Simms, From Kings to Warlords: the Changing Political Structure of Gaelic Ireland in the Later Middle Ages (Woodbridge 1987). C. Breatnach, ‘The murder of Shane O’Neill: Oidheadh Chuinn Cheadchathaigh’ in Eriu XLIII (1992). B. Cunningham, ‘The Anglicisation of east Breifne: the O’Reillys and the emergence of county Cavan’ in R. Gillespie (ed. ), Cavan: Essays on the History of an Irish County (Dublin 1995). B. Ó Cuiv, ‘The Irish language in the early modern period’ in T.W. Moody, F.X. Martin and F.J. Byrne (eds. ), A New History of Ireland III, Early Modern Ireland (Oxford 1976).